Seating for the General Seating section is in the Waterworks Grandstands. Reserved Seating for the Commodore's Club area is in the Waterworks Grandstands. Rows 1-20 and rows 21-25. Judges Stand: Located at the Start / Finish line. Great view of the course but some distance from the pits. PIT TOWER: Exclusive private area and highest view of the course. CLUB GOLD CUP: Our premium ticket - a catered VIP tent in pit corner. 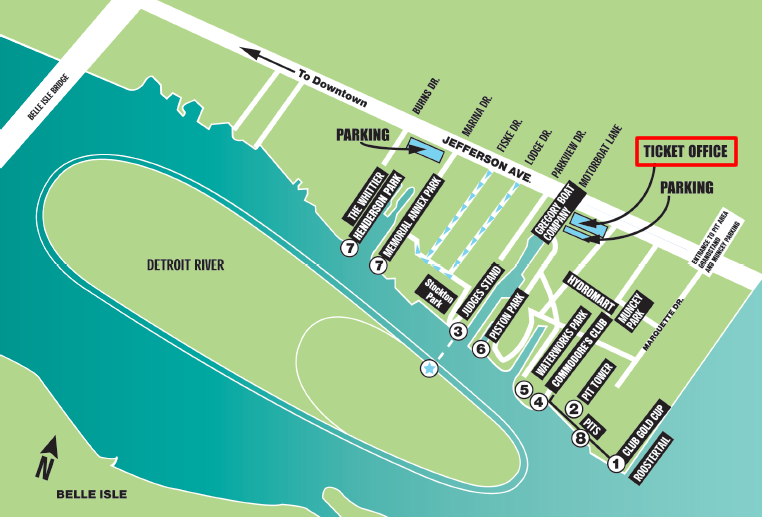 General Admission Parks are located at Erma Henderson Park, Memorial Annex Park and Owen Park. BILL MUNCEY PARKING: Behind the Unlimited Pits and Pit Tower. PISTON PARK PARKING: Parking in Waterworks Annex. Although DREI believe enough spaces are available to accommodate all pass holders, no guarantee can be given that weather and/or other conditions beyond our control will permit parking for everyone.